In the second post for today's Bumper Sunday, I will be talking about the past. You can see that there is a difference in size between the Terminators/Demon Prince and the standard marine on the right. This was planned to show the continuing power of corruption that chaos has. You will also notice that there are different colours. That is because this is a band of renegades so expect them all to be different colours with the only unifying mark being the 'three claw' mark on a shoulder pad that shows them to be Dire Wolves. Whew! What a lot of stuff today! In other news... I just bought a copy of White Dwarf on a whim! I am a lost soul indeed! See you from the safety of a pentagram! Lots of computer training, a trip to Boscombe Down to measure stuff, a Merlin '10 years on operations' event, a 25 year anniversary, news of a short term promotion, painting things AND even a little bit of sculpting... not to mention joining in with the latest UDoD on the FoD! One of the great things about being in the Royal Air Force is that when you have to travel anywhere, you can get transport provided. Depending on cost and where you are going, this can be anything from rail-fare to a hire car. For my trip to Boscombe Down, I was given an almost new Ford Fiesta. It was a diesel and was great fun to drive (better than my own car). It sort of makes up for all the short notice travelling you are sometimes asked to do. The 10 years on Operations event was a great opportunity for me to catch up with friends who I haven't seen for as long as ten years! My better half and I, had a lovely evening of good food, good drinking and excellent company so it was really worth going. One thing about the forces is that once you make a friend, no matter where they go, they are a friend for ever and you just pick up where you left off. Yesterday was the 25th anniversary of me joining the Royal Air Force. I can still remember raising my hand and swearing on the bible that I will be the Queen's (or her successors) humble servant. It was in Exeter and the very next day, I was on a train to Royal Air Force Swinderby to start my journey. Over the last 25 years there have been plenty of ups and downs but I wouldn't have changed a thing. I have achieved so much and been to so many places that I would never have gone to had I not joined up so I can safely say that it was the perfect choice for me to make. It was most certainly 'one in the eye' for many of my friends at home who thought that it wouldn't last (and they are still back at home doing the same-old, same-old). I would recommend the Royal Air Force to anyone. It is just like any other job... but with more opportunities. It is a Reaper Dragon of some description and has slipped a little in the mould so it is going to need a lot of green stuff action to sort out all of the scales and things. I am thinking that this one is going to be a plains Dragon so it will be green with maybe a bit of yellow here and there. The base is going to be a mix of stones, rocks and vegetation. I have a lot of work to do on this one and am already looking forward to the next Dragon because I have checked it and it is pretty clear of any major issues to sort out. 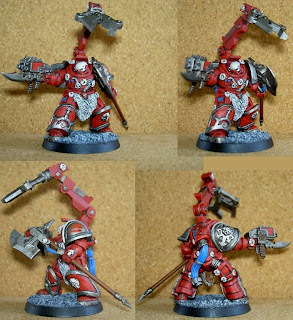 and that made me dig him out of hiding... so I have been painting Space Marines (yes... plural!). But I'll save that for a bit later on today. See you from the time portal! It's Wednesday and it isn't even 21:00hrs in the evening and I could just go to bed... but I can't because I am over tired and I'll just wriggle. I have had one of those weeks (so far) where I don't know what the heck is going on. I've had 'floorwalkers' around at work and they insist on helping you learn the latest computer system when, to be honest, I can work it out. No sooner did that finish on Tuesday when today, I start another course to learn about another computer system! It really does make me wonder where I went wrong in life... I'm an aircraft technician, not an I.T. consultant! This week is actually a bit special for me. Not only is it the25th anniversary of me joining the Royal Air Force but it is also the tenth anniversary of the Merlin helicopter being on Operations. There is a big party on Friday and I am looking forward to seeing a load of people I haven't seen since I was in Iraq with the Merlins in 2007/2008. I have to pick the tickets up on Friday but on Friday I am also having to go on a road trip for work... so I hope I get back in time! 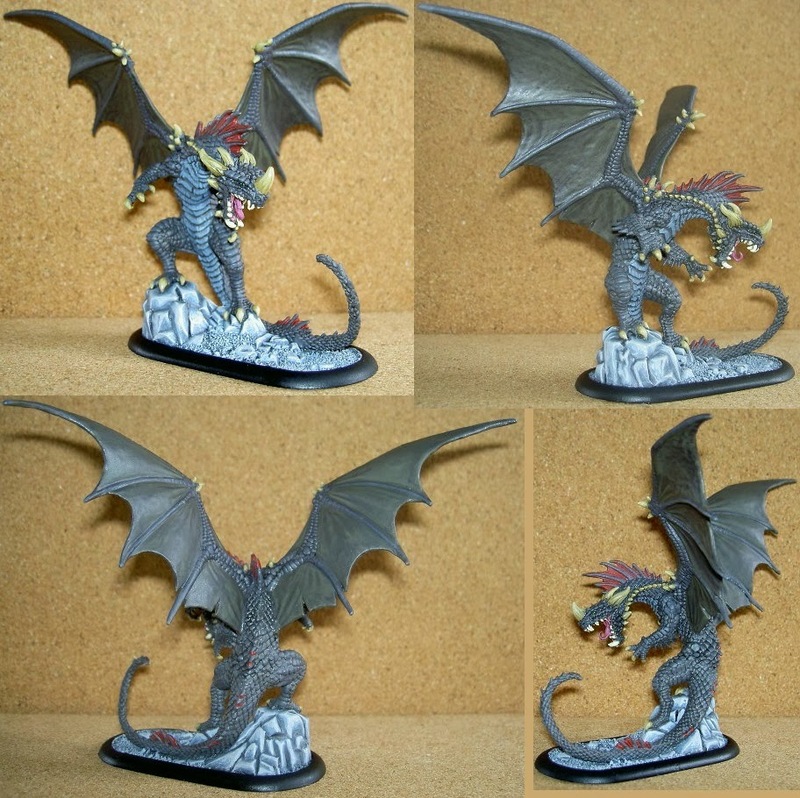 On a hobby related note, I have been painting the Dragon and have got a fair bit done so I hope that when I show it off on Sunday, you can see the progress. I have also dabbed a tiny amount of paint on the golem. I would be painting tonight but I have not been sleeping lately and it has started to catch up with me... lots of headaches and a 'can't be arsed' attitude. 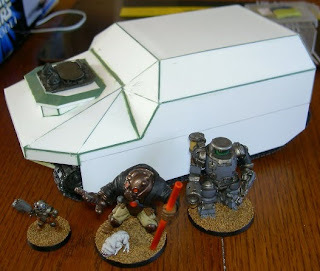 I have decided to give the Diorama of Doom a go again this year...here's the LINK. I don't have any miniatures for it yet but I haven't decided what to do yet... or have I?! On the bright side, I am getting a temporary promotion in a few weeks... Flight Sergeant for a month and a half. Can't be bad, can it? Sheesh! Is it bedtime yet?! See you from a place on the edge of the circle... not inside the circle or outside the circle... but on the edge of the circle! 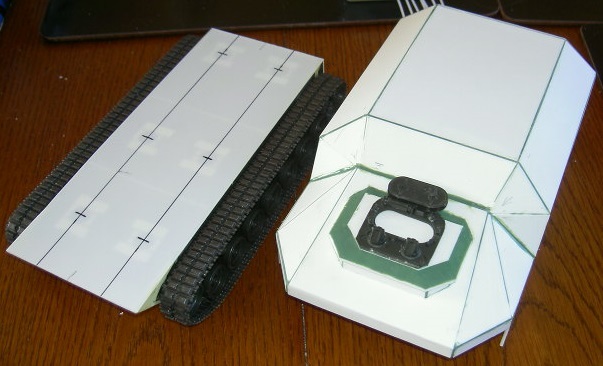 Well, this has been a week of chopping up plasticard and filling holes and it has nothing to do with Command transports for my Tunnel Fighters. I have been 'tinkering' with my little aircraft and have got to a point where there will need to be a lot of sanding... so as you can imagine, there is very little of interest to show off that doesn't just give a general impression of shape. There are two things to note... they are both WIP and they both have a way to go. The golem is a bit of a strange mini but I can see him accompanying a Dragon Slayer who controls it with some sort of mystic gift from the Mhurni (I haven't really thought about it too much at the moment but there is a seed of an idea there). In other news, Iron Man 3 is now out on DVD; which is nice. 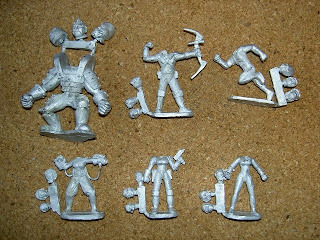 I have put in an order with Puppets War for a few of their 'Air Strikers' and some alternative heads. It is a joint order to split some packs with a mate so it is a good way to sample the products without breaking the bank... especially because I have plans for the jet packs if they are the correct size... but that is another story for another time. And so another week came to pass... another week that inevitably drags us all towards Christmas. See you from the cellar under the secret room! Before I start this week's post, I'd like to welcome Dungeon Master to Inso's World. Please feel free to share ideas and comment on the posts. This week has been an interesting one. Lots of work during the day, lots of disturbed sleep due to the dog next door and an evening in the mess to commemorate the Battle of Britain has meant that my hobby time has taken a hit this week. 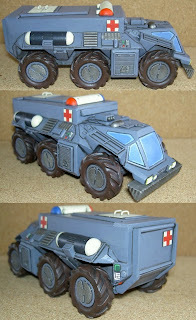 All I have managed to do is add a few plates to the side skirts of the command vehicle. It has also been one of those weeks where I have been gripped by an idea that has been circulating around my head for a while... but at the moment, it seems that it won't go away until I have at least tried to scratch-build something... so I have started to do just that. What is it? Well... it is 'hopefully' going to be a Grymn aircraft but beyond that, I'll keep it to myself until I have something solid to show off. So... not a lot to speak of really. As you can see from the picture, I have three males and three females. I haven't assembled them (obviously) but I can see that they are well cast, have minimal clean up and have some nice details (not to mention plenty of head options). I can also see that the females in particular, have some serious proportion/anatomy issues that will need fixing... but nothing too disastrous that can't be fixed once I decide to get to work on them. My personal thoughts on these are that the original sculptor did a much better job and the latest sculptor needs to get to grips with an anatomy book and learn to sculpt the female form. Am I disappointed? Not really. Many people will be able to look past the proportional flaws and just live with it so it means that there are now a few more superhero miniatures on the market for everyone to enjoy... and through Kickstarter, I helped that happen so how can I be disappointed? 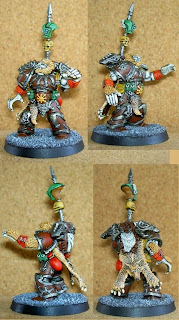 With a little work, I will sort the miniatures to my satisfaction as well... not ideal... but liveable with. 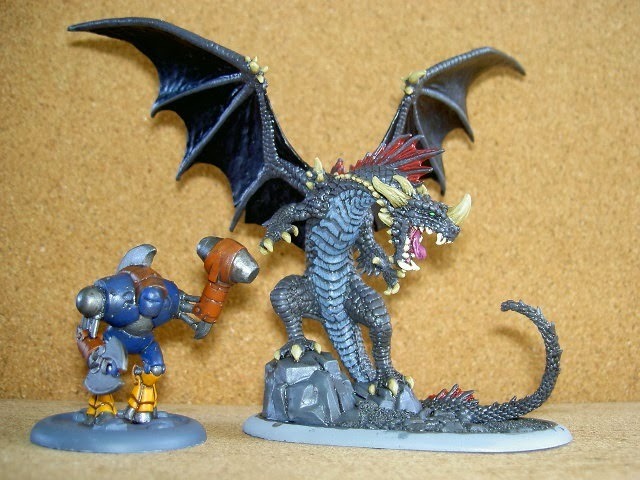 So there you have it... great quality miniatures but with a few odd proportions. I think that will about do for today... I have a fuselage to build. See you from the manufacturing hangar! 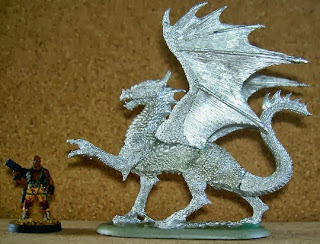 Welcome to Dungeon Master, the newest visitor to my blog! I hope you enjoy your travels here. This is just a quick post to say that I had a nice surprise at lunchtime... my Kickstarter parcel from Crossover Miniatures arrived. 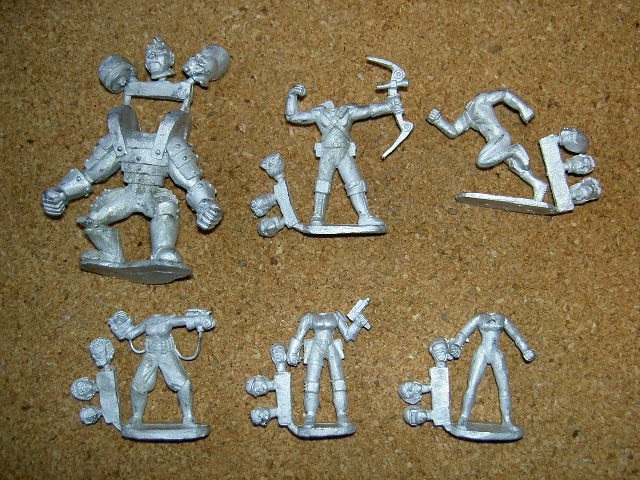 Inside were six metal superhero miniatures one quite large one and five human sized ones (in a 28mm sort of way). Three boys (one of which is the big guy) and three girls. Lovely crisp casts too. When I get around to it, I'll post a bit of a review. Now all I need is for my other two Kickstarters to follow suit and I'll be really happy (although I don't expect one of them until next year). See you from under the sofa! Turtle power and command vehicles. I have noticed another follower has arrived and I believe it is Maj. Diz Aster. If it is you or indeed, someone else... you are very welcome to my blog. Please feel free to get involved. As you can see, they are large and a cross between dinosaurs and turtles... but everytime I look at them I just think of Pokemon. With minimal conversion, I reckon these could easily be turned into a decent sci-fi force and for £14.99 for a box of eight players or £9.99 for Dozer, they are tremendous value. So I still have a way to go but it is a very good start. See you from the bus lane! Well this has been a week and no mistake! Bank holiday Monday, action packed day at work on Tuesday, Health and Safety course for the rest of the week with a presentation to do on the final day. All that and, as you saw on Thursday's post, a bit of hobby stuff on the side too. I have painted it in line with the rest of the vehicles so it looks a bit 'flat' but that is just the way of it. It is funny but, when I put this one up against the other Marauder conversion, I noticed that the colours were different. The older vehicle was lighter grey and had different coloured tyres! My excuse? It was put together in a different workshop that specialises in medical vehicles and they used different tyres and didn't have the perfect shade of grey! That is my excuse and I am sticking to it. It is based on a Flakpanzer Gepard 1/35th scale kit so it will be quite large. Due to it needing to be quite tall, I may make it so that the top section can be removed for transport (by using some magnets). I have still not decided on how I want it to look but it will be able to feasibly contain two OGrymn, a battlesuit and a small selection of Grymn (the Special Command squad). Fortunately, I was in town yesterday and was able to pick up some cheap paint from Modelzone (due to it closing down) so I will be able to spray the wheels before going too far with the build. Cool stuff, I am sure you will agree. See you from the beach!